A stunning example of Early American Furniture, our Colonial Sierra Class Collection has just the right timeless, antique look to make the perfect statement in your home. As an extension of your storage suite, our Sierra Armoire offers three full-extension drawers to hold your clothes and linens. Add the undermount slides to your drawer boxes for a unique "floating" appearance that offers a soft-close mechanism to ensure your drawers close quietly, every time. 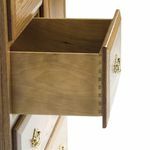 The versatile top cabinet comes standard with two adjustable shelves that can arranged to hold sweaters, blankets and other infrequent items for easy access. Add the option clothes rod and your new armoire becomes a closet to hold your shirts and pants. 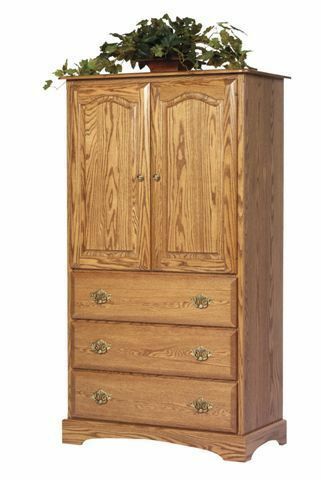 If you are looking for a place for your television, without add the clutter of wires to maintain that authentic look, this armoire's cabinet can be transformed to include pocket doors, knockout back panels, a DVD shelf and TV swivel, so you can have your flawless bedroom suite without missing your favorite shows! 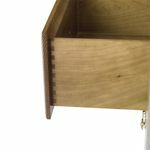 As shown, our Colonial pieces are most popular in an Oak or Quarter Sawn White Oak hardwood with a light finish that really brings out the bold grain patterns and gives it an original, authentic feel. However, you can customize this armoire and make it your own with an array of beautiful hand-selected hardwood and rich finish options that ensure your new piece can be incorporated into any decor.